Welcome back to our Featured Physician series! We're excited to showcase our Regeneris Physician Affiliates and tell you about their practices, why they became interested in regenerative medicine, and technologies they're excited about. Today we'd like to introduce you to Dr. Ryan Welter, M.D. Founder and CEO of Regeneris Medical in Boston, MA. Regeneris Medical began with the simple idea that the human body contains most of what it needs to heal itself within its own stem cells and biologic mediators. We have embraced a focused commitment to providing research level therapies to patients today, allowing patients access to the most advanced regenerative therapies available. Through regenerative medicine and outstanding patient-centric service, I see an opportunity to change the face of modern medicine. It is my goal to be recognized as an innovative and respected leader in the field of regenerative medicine in practice, research, and education. I believe that in the near future, almost every medical treatment will include at least some component of this emerging technology. I foresee a day when Doctors are much less dependent on pharmaceuticals and have harnessed the natural healing and regenerative properties of the human body to the fullest extent. I have my own YouTube channel (www.youtube.com/user/WelterMD) where I share skincare treatments, exciting new announcements, and an inside look of a cosmetic surgeon's life. Check it out if this interests you! Welcome to our Featured Physician series! We’re excited to showcase our newest Regeneris Physician Affiliates and tell you about their practices, why they became interested in regenerative medicine, and technologies they’re excited about. 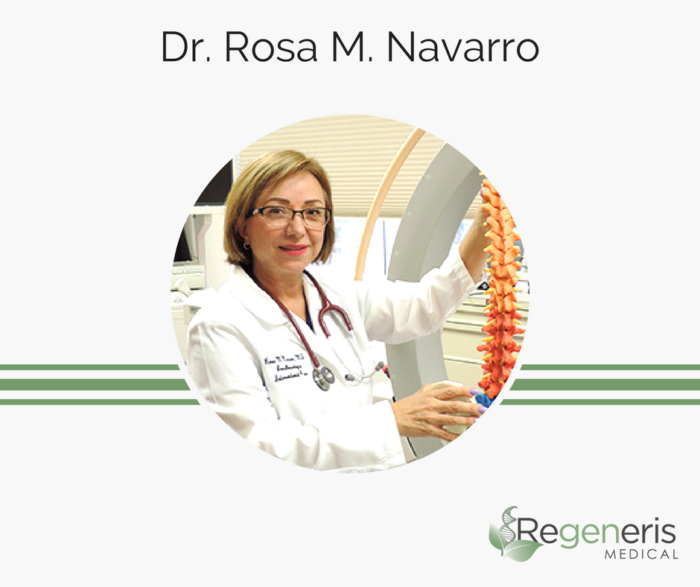 Today we’d like to introduce you to Dr. Rosa Navarro, a Pain Management Specialist from California. Our practice is located in the southern part of San Diego in the city of Chula Vista. We proudly cater to the Hispanic community and all of our staff is bilingual English-Spanish which facilitates communication and or medical education to our patients. Currently in our practice we offer a list of advanced minimally invasive interventional procedures such as, epidural steroid injections, joint injections with ultrasound, medial branch blocks, facet joint injections, sacroiliac joint injections, spinal cord stimulation, stellate ganglion blocks, ketamine infusions, nerve root injections, trigger point injections, lumbar sympathetic blocks, radiofrequency ablation, and our newest addition regenerative medicine. Regenerative medicine is a new treatment modality that we are excited to introduce to our patients as an alternative choice for Pain Management. Regenerative medicine’s promise is in its ability to work with the body’s reparative mechanisms, thus healing the local tissues and halting the propagation pain. It is effective and proven to demonstrate faster pain control and healing, making it a logical add-on therapy to our current list of services. The technologies that are exciting in this field are the usage of PRP (Protein Rich Plasma) from patients’ own body, combined with stem cells from fat and bone and incorporating them back into their body and seeing the effectiveness in the process of centrifuging and delivery methods. Whether you’re a patient here at Regeneris Medical, just learning about our practice or simply interested in the newest game changer to the medical field, regenerative medicine can still be a hard term to grasp. An easy way to explain regenerative medicine, if your still unsure, think of a starfish. When a starfish loses an arm, a new arm grows back. Regenerative medicine ‘grows back’ damaged tissues or organs in our bodies. The promising field also gives scientists hope to grow tissues and organs in a lab to help patients seeking organ donation. According to the National Institute for Health, “as of August 2010, there were approximately 108,000 people on the waiting list for donor organs. Many of these individuals will die before a suitable organ can be found” as well as “approximately 500,000 Americans benefit from a transplant each year.” With these alarming statistics for just organ donation, regenerative medicine isn’t only a promising field for new life, it’s a necessary field to save lives. The term ‘stem cells’ has been given a bad reputation ever since it came about. Most people associate stem cells with the umbilical cord of a newborn baby but stem cells are actually found in other locations and here at Regeneris, we focus on those other areas to better our patient’s health. The areas we focus on to gain stem cells is Adipose tissue which is loose fat that is found all over the body, mainly the abdominal area. We use two different techniques in order to collect stem cells to help the regenerative process, Platelet Rich Plasma and Stromal Vascular Fraction. Platelet Rich Plasma (PRP) - Platelet Rich Plasma is taking a portion of the patient’s blood and through a process of centrifuging the blood, separating the red blood cells from the platelets. Once separated, the platelets are of a higher concentration and whent they’re activated, the environment created promotes crucial healing. The process of PRP has been around since the 1990’s and through the years, clinical studies have shown that these injections are of much benefit to other areas in need of repair such as the elbow, wrist, shoulder, hip or knee. Stromal Vascular Fraction (SVF) - Stromal Vascular Fraction is a state of the art technology that entails a mini-liposuction procedure extracting the stem cells from that tissue. Once the cells are abstracted, they are then injected directly into areas of concern, typically the knee, spine or scalp. At Regeneris, our protocol yields high viable cell counts to give our patients the best possible outcome. So how does Regenerative Medicine actually improve patient lives? With the amount of people dying and becoming sick each year from various disease, rejection of organs, not being able to obtain an organ or the natural wear and tear, being able to have the option to use your own body to regenerate itself is exactly how patient’s lives improve. Being able to find ways to help your body heal itself, with itself, promises for a better and healthier quality of life. There’s many diseases and illnesses out there that are only treatable by treating the symptoms (i.e. Arthritis). Being able to treat the disease itself with Regenerative Medicine offers solutions and great hope to patient’s who suffer from illness beyond repair. The National Institute for Health describes the future of Regenerative Medicine in a great way, “imagine a world where there is no donor organ shortage, where victims of spinal cord injuries can walk, and where weakened hearts are replaced. This is the long-term promise of regenerative medicine” and this is how regenerative medicine at Regeneris Medical delivers tomorrow’s healthcare, today. There are many options for treating unexpected hair loss, with treatment being most effective when the condition is detected early. Knowing the difference between typical hair loss and unexpected balding is sometimes difficult. Here are the best ways to tell if you’re going bald. Everyone loses 50-100 hairs per day in order to make room for newer, healthier hairs. If your hair is falling out in handfuls or you see a major increase in your shedding quantity, you may be starting to go bald. If there are any patchy, bare areas of your scalp where there wasn’t before, you may be experiencing unwanted hair loss. Be sure to check out all areas of your scalp, including the back of your head. Take notice of your hairline - is it receding? Balding people (men in particular) often experience a receding hairline in the early stages of hair loss. It may be helpful to take a photo of your hairline and use it to compare two weeks or a month later to see if there’s been any change. Before and after photos are not only helpful for evaluating a receding hairline, but also for evaluating general hair loss. Ask a spouse or friend to take photos of your hair over the course of 2-4 months and study the photos to see if there’s been a change. A quick way to tell if your hair is thinning is to wet your hair in the shower or sink and see how much of your scalp is visible; if you can see an inch of your scalp or less, your hair is full and healthy - any more than that and you may be balding.